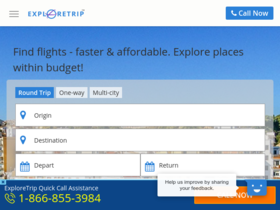 Act now and save $15 off your travel booking with this code from ExploreTrip. Use this coupon code to save $50 off any flight from ExploreTrip.com. Book online with ExploreTrip.com and save up to 90% on flights. Use this coupon code online at ExploreTrip to save up to $15 on your booking. Check out ExploreTrip.com online for their latest discount and special offers.